WELCOME TO THE CIRCULAR BREATHING MASTERY PROGRAM, SPECIALLY DESIGNED TO HELP YOU BECOME ADEPT AT PLAYING THE DIDGERIDOO. 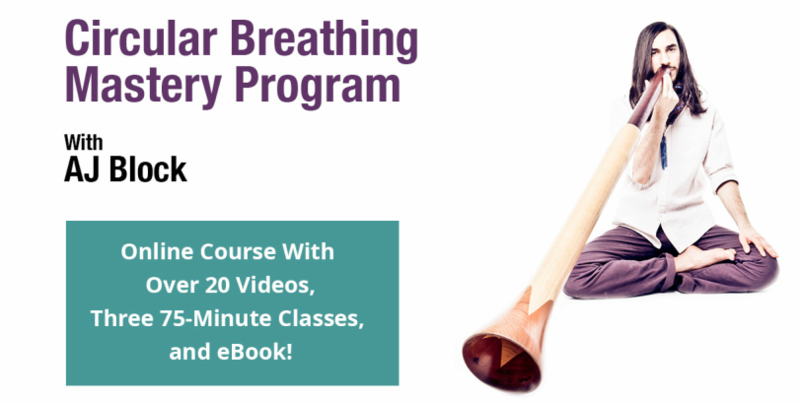 This program will help you move beyond the foundational techniques of didgeridoo playing and give you everything you need to master circular breathing. It includes live and recorded training sessions, step-by-step practice worksheets not available elsewhere, and a rich, supportive community of people with the desire to learn to play the instrument, all designed to challenge you to believe in yourself, get you to master the didgeridoo and break through to exciting new levels of musicality, confidence, and more. This program is led by the Didge Project's AJ Block. Circular Breathing Mastery is perfect if you’re new to the didgeridoo or are an experienced player that wants to implement circular breathing into your playing. This program is for you if you are interested in taking your didge playing to the next level or are simply looking for the gratification the comes with the breath centered practice of the didgeridoo. 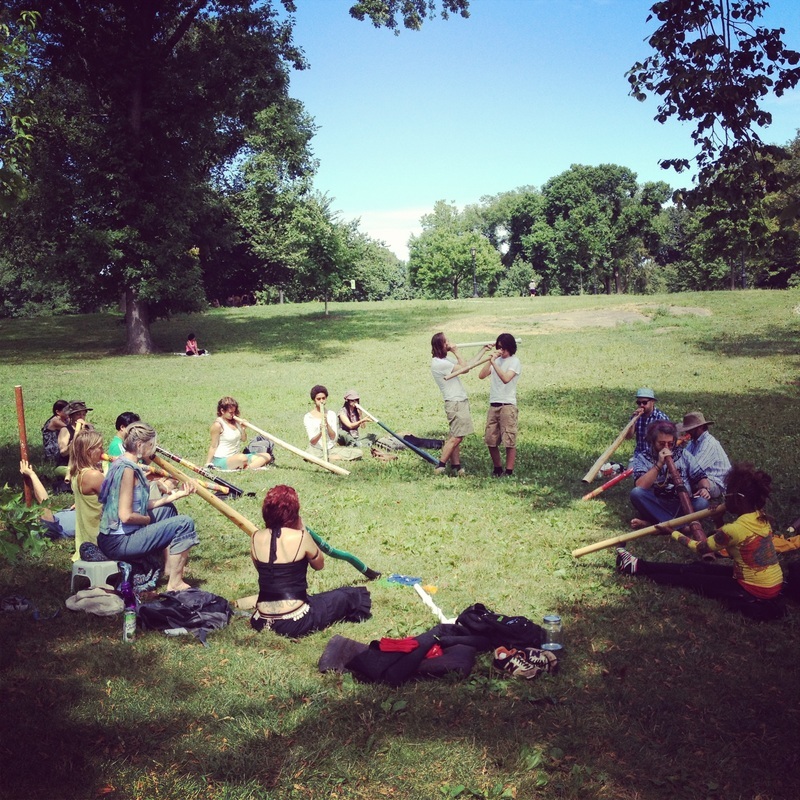 With our thorough curriculum this program ensures your progress as a didgeridoo player. Circular breathing is a wind instrument technique that allows the player to sustain a tone for an extended period of time. This is accomplished by storing air in the mouth (inflating the cheeks) and using this reservoir of air to inhale through the nose while air is still coming out the mouth. Circular breathing can be seen as a variation on normal breathing: at its essence the player inhales through the nose and alternately exhales out the mouth. Circular breathing is key to didgeridoo playing because it allows for the continuous drone to remain unbroken, forming a strong foundation for the complete sound. Learning to circular breathe is like going to the gym: you work to develop muscle tone, flexibility and control. Each class blends in-depth training, exercises, practice regiments and multifarious approaches to get to the goals of didgeridoo playing including: holding sonic space, playing with compelling rhythm and tone, circular breathing, and rhythmic playing. This format is designed to help you understand at a deep level how to move your playing forward by quantum leaps instead of by incremental steps. Expect to be challenged and supported as we guide you to create a plan of action for your development as a didgeridoo player. These recordings are yours to keep forever. You will never be at a loss for what to practice because all exercises will be provided for you in written format. These worksheets show you exactly what steps to take in what order to master the technical side of didgeridoo playing. Over 25 videos show you exactly how to execute each technique from making the basic sound to playing rhythmically with circular breathing. Yes, all audio, video and written content is downloadable and yours to keep forever. My path to playing the didgeridoo began with difficulty staying asleep at night and low daytime energy. An overnight sleep study showed that I had sleep apnea. As recommended, I purchased a CPAP machine and oral appliance but found them too uncomfortable to utilize. I asked the doctor, "Are there any throat exercises I might try?" to which he replied, "the only exercise we know about that has shown to help sleep apnea is playing the didgeridoo." The doctor gave me the contact information for Didge Project in New York City where I met and began to study didgeridoo with AJ Block doing private lessons and his group program. From the very beginning of my experience with the didgeridoo I pretty much fell in love with it. I found it enjoyable to play, and I decided immediately that I would continue playing beyond the therapeutic sleep apnea practice. After two weeks of playing daily I became aware that I was sleeping much better. I believe that this was a combination of the strengthening of my throat muscles and the meditative state induced by the vibrations of the didgeridoo. Since then, about two years ago, I do not consider myself to have a sleep problem anymore. It is truly wonderful to no longer be living my life in a state of sleep deprivation. I have taken two group courses with Didge Project, and both of them were fantastic, inspiring and uplifting. AJ and the Didge Project team are wonderful teachers, great people to be around, and their teaching style is very diverse. The didgeridoo is the first instrument I really enjoy playing because it is so profoundly basic and yet engages you physically and spiritually in complex and fascinating ways. I was actually surprised how quickly I could learn to make sounds and rhythms. The classes are clearly structured and methodical, lots of hands-on practice and personal guidance. I am now playing didge in yoga classes and people absolutely love the experience of its healing earth vibrations. I highly recommend any group classes or private sessions with Didge Project, please check it out and embark on a journey into peaceful sound! Register in full for just $47!